This weekend I have not been as busy as I could have, but it was not totally without achievement. On Friday night Jel and I went out for dinner. He had been away for a week and it had been a long week of solo cooking, so he kindly chose to whisk me away for a nice Chinese dinner at Tai Pan in Manchester. I had been hearing about how good this restaurant is for the last 18 months and this weekend was the weekend I finally got to go there. I won’t go into pages and pages of detail but it was very nice. It was authentic and not too ‘westernised’. Saturday night I was planning to cook but a last minute change of plans saw us out again with some friends for a simple burger and a glass of wine and some good conversation. Although good conversation around Jel and Maurice tends to be all about the aviation industry and little else, but I have certainly learned a lot from it and it can be interesting so I won’t complain. After all, I do believe that life is too short for complaining. So todays culinary exploits were pasta with scallops and lemon butter, and chocolate brownie and ice cream for dessert. I have never cooked scallops before as I have always been a little scared of them to be honest. There is all the pressure not to overcook them or they will end up like little balls of fishy rubber. But my fear was rather unfounded. It was a fairly basic recipe, some fresh pasta that I made this afternoon, and some lemon butter. Fresh pasta is some work but it isn’t nearly as hard as it sounds. Its a simple ratio of 1 egg per 100g of flour, and 2 eggs and 200g of flour makes enough pasta for about 3 people. That and 8 minutes of kneading and you have pasta dough, and the pasta machine takes care of the rest. While the pasta is cooking, melt 60g of butter and a bit of oil to stop it burning, then add 2tsp f lemon zest and a good grinding of black pepper and cook for a few minutes. Then add the scallops and cook for 30-40 seconds per side and then turn the heat off. Drain the pasta and then toss with the scallops and lemon butter and serve. Its a simple dish but a nice one infused with subtle flavours. The brownie recipe is one that I found online and that professed to be excellent so I thought it was worth a try. It as chocolate in in, what can ever be wrong? 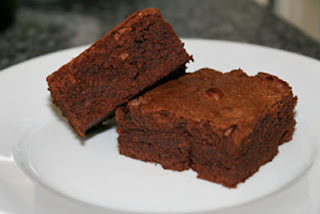 They did turn out very nicely and although it is not the simplest recipe for brownies, it is worth the little extra effort. So here is the recipe and you can try for yourself. Getting ready: Center a rack in the oven and preheat the oven to 150°C. Line an 20cm square baking pan with foil, butter the foil, place the pan on a baking sheet, and set aside. Sieve together the flour, salt and cinnamon, if you’re using it. Put the chocolate in a heatproof bowl and set the bowl over a saucepan of simmering water. Slowly and gently melt the chocolate, stirring occasionally. Remove the bowl from the saucepan and add the butter, stirring so that it melts. It’s important that the chocolate and butter not get very hot. However, if the butter is not melting, you can put the bowl back over the still-hot water for a minute. If you’ve got a couple of little bits of unmelted butter, leave them-it’s better to have a few bits than to overheat the whole. Set the chocolate aside for the moment. Working with a stand mixer with the whisk attachment, or with a hand mixer in a large bowl, beat the eggs and sugar until they are thick and pale, about 2 minutes. Lower the mixer speed and pour in the chocolate-butter, mixing only until it is incorporated-you’ll have a thick, creamy batter. Add the dry ingredients and mix at low speed for about 30 seconds-the dry ingredients won’t be completely incorporated and that’s fine. Finish folding in the dry ingredients by hand with a rubber spatula, then fold in the raisins along with any liquid remaining in the pan. Scrape the batter into the pan and bake 50 to 60 minutes, or until the top is dry and crackled and a knife inserted into the center of the cake comes out clean. Transfer the pan to a rack and allow the brownies to cool to warm or room temperature.